To many Housewives it is a great pleasure to delight your loved ones by cooking delicious and healthy meals. This does not necessarily need to buy expensive products. 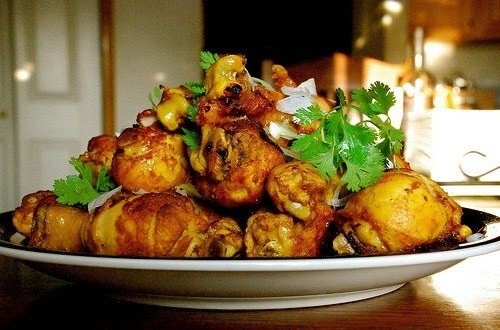 Very tasty dishes can be prepared from chicken legs, which are able to impress even the most fastidious gourmets. In smackaholics Shin Shin, a little dry, add salt and leave for 15-20 minutes. Egg whisk. Now each drumstick, dip in eggs, then in flour, then in eggs and flour. The surface of the shins and sprinkle with seeds. Fold the legs into the baking dish and place in pre heated oven at 180 degrees for 40-45 minutes. Finished Shin sprinkle fresh herbs and serve with mashed potatoes. Of Shin Melograni rinse thoroughly with water, let dry a little and put in a large pot. Then add salt, pepper, add the honey, spices, a little wine and lemon juice. Cover and leave for 30-40 minutes. Put legs on a baking sheet, then on each of them put one slice of tomato and slice of cheese. Bake at 180-200 degrees until cooked. Steamed galenbecker cut into small cubes, add salt, leave for 30-40 minutes, then rinse with cold water. It is necessary to cut the bitterness of vegetables. Onions and tomatoes cut into cubes and fry together with eggplant in vegetable oil for 5-7 minutes. Now add drumstick, salt, pepper, sprinkle with herbs, cover and simmer until fully cooked. Chicken drumsticks in testoserone Shin wash, dry, RUB with salt and pepper. Fry until cooked. Onions finely chop and fry in vegetable oil until soft. Add frozen vegetables and simmer for 20-30 minutes, add salt, pepper. Cool. Puff pastry roll out and cut into squares of 15x15 cm. Sheets parchment paper cut into squares of 25x25 cm. On the table lay a square of parchment, and put a square of dough.The square of dough place some of the filling, top filling, put a small slice of cheese and set the leg. Wrap the legs of the test and the parchment so that the bone remained on the outside. Put "bags" on a baking sheet and bake in a preheated 200 degree oven for 20-30 minutes. Approximately 5-7 minutes until cooked, remove the legs with parchment paper, brush them with egg and put in the oven for 3-5 minutes to brown.